ModernWicker.com is an online retailer specializing in high-quality modern outdoor furniture at clearance prices. Each piece of furniture is hand crafted using only the highest quality synthetic resin materials available on the market. The frames are made of commercial grade powder coated aluminum so they will never rust. The beauty and craftsmanship of our products simply cannot be replicated by a machine. We stand by the quality of our resin wicker patio and outdoor products and each piece is guaranteed not to fade, crack, peel, or rust when subjected to the elements. This is hand crafted all weather outdoor wicker that will look beautiful on your porch, patio, or poolside and last for many, many years to come. If you want to Buy Patio Furniture please visit our sister store Modern Patio Design. Online Sale for Patio and Resin Outdoor Wicker - Modernwicker.com is Your Place To Shop! We offer a large selection of outdoor patio furniture with many different styles and colors. You can shop online at any time using our completely secure online ordering system. You will not have to pay any sales tax unless you are a New York State resident. Our expert customer service and sales specialists are available to help you. Most collections come with heavy duty, commercial grade, rust proof powder coated aluminum frames. We offer a large selection of premium, quick dry, comfortable, deep seating outdoor cushions and fabrics. You can use your all weather wicker in any outdoor environment and it will not fade, crack, or peel. All of our furniture is made for outdoor use and can be left outside year round. We offer industry leading manufacturer's warranties of 3 to 4 years on most brands. Our patio furniture requires no maintenance and you can simply clean it with soap and water. We sell only the highest quality all weather modern outdoor furniture available and offer free shipping. Stop hosting your backyard family get together or parties with uncomfortable old metal folding chairs or dirty picnic tables. 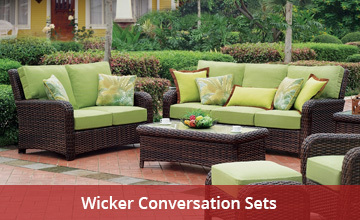 Move your living room outside with one of our discount wicker and modern outdoor furniture sets. Your family and guests will definitely enjoy the style and comfort of relaxing in quality patio wicker that not only look fantastic, but is made with ultra durable weather resistant materials that will last a lifetime. We know from experience and great customer feedback that this furniture will definitely be the pride of your deck, porch, poolside or patio. And best of all it can be left outside year round. We also have a large selection of premium spun polyester and Sunbrella replacement outdoor cushions with fabric options available to match just about any home decor. At ModernWicker we combine the elegance and craftsmanship of traditional rattan with 21st century resin technology. Browse our complete line of discount patio furniture including outdoor wicker patio sets, resin wicker chairs, wicker rockers, wicker dining sets, wicker chaise lounges, wicker sofas, wicker gliders, wicker porch swings, and more. Our most popular collections include Forever Patio Hampton, Barbados, Pavilion, Cypress, Capistrano, Leona, and Rockport collections. We also carry the complete line of South Sea Rattan wicker including Bahia, Carlyle, Java, Key West, Martiniue, Montego Bay, Riviera, and Saint Tropez. 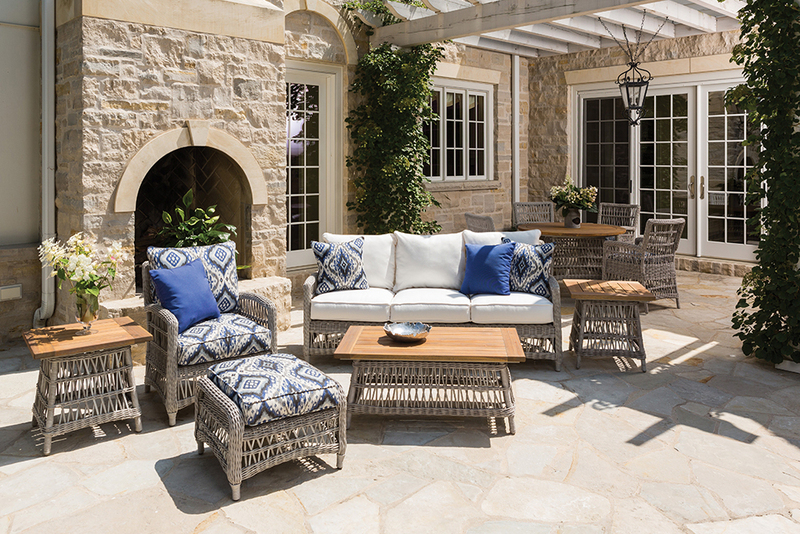 The Tortuga Outdoor Lexington and Portside wicker collections are also sure to please with their durable high-quality materials, superior comfort, and discount pricing. New to the market from Source Outdoor are the beautifully designed contemporary collections Como Lago, King, Manhattan, Naples, Panama, St. John, and St Tropez. We are also proud to now offer Lloyd Flanders wicker which is still considered the best outdoor wicker ever made. Other quality manufacturers include Hospitality Rattan and Panama Jack. If you're looking for the highest quality resin outdoor wicker available at discount prices you've come to the right place. Our outdoor patio selections change from time to time as new collections and manufacturers are added or removed so be sure to check back often for the greatest deals on wicker patio sets, dining sets, sectionals, wicker chairs, chaise lounges, and much more. 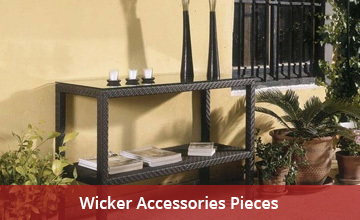 At ModernWicker.com you are sure to get the best service at great prices. 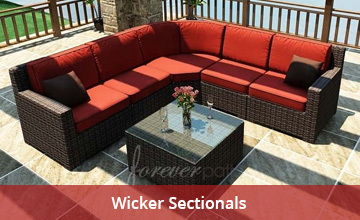 ModernWicker.com is a Factory Authorized Outdoor Wicker Funiture Dealer. We are an authorized dealer of Forever Patio, South Sea Rattan, Tortuga Outdoor, Source Outdoor, Panama Jack, Hospitality Rattan, and Lloyd Flanders. This ensures you get the best service and 100% backing by the manufacturer for any quality, damage, or warranty issues you may encounter. If you see any of our products listed on another web site at a lower price simply give us a call and we'll do our best to beat that price!